We are excited to share that we have added group email messaging, custom email templates, and response tracking to help you engage your audience in a personal way. Our new Group Messages feature allows you to send personalized group messages to any segment of your contacts. Group Messaging allows you to send personalized messages from your own email identity to any of your contacts. This makes each outreach appear as a sincere one-to-one conversation rather than a mass email blast. An awesome reporting dashboard to help you see your open rates, who opened your email, and how many times someone opened it. *Click tracking coming soon. Go to Messages and select “Group Message” from the “New Message” drop-down. Stop retyping the same emails you repeatedly send! Now you can save time when you use our custom email templates featuring fonts, formatting, file attachments, and custom merge tags (i.e. First Name, Last Name, Company, Title). Build beautiful and actionable email templates with custom merge tags, hyperlinked text, and save them for future use. You send business emails to get engagement and drive results. Our new Message Reporting Dashboard notifies you the moment someone opens your emails and how many times they open it. You can also see total email open rates for group messages, percentage of emails opened and soon, Click and Reply tracking too. To access your Group Message report, go to Messages and select “Group Message” from the left-hand menu. After you send your message, our reporting dashboard will display the contacts you’ve sent to, and you’ll see who has opened your message, when it happened, and how many times they’ve viewed your message. We love to hear people talk about how sales and marketing should work together because we’ve been saying and doing that for over 25 years. 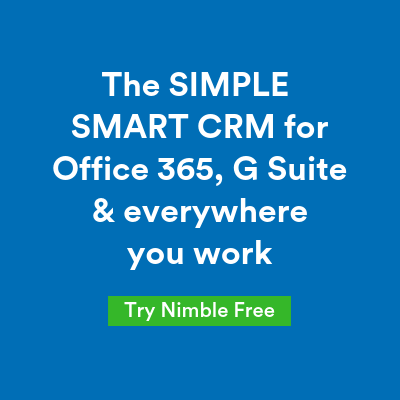 Nimble was founded by the team that built GoldMine, the company that pioneered CRM, SFA and Marketing Automation. Our award winning Simply Smarter Social Sales and Marketing platform continues GoldMine’s blending of relationship management with Sales & Marketing automation. Nimble will follow this release soon with Smart Social Segmentation so you can easily segment contacts to message based on the rich social data we update daily in each company and contact record. We know that you don’t simply live in Nimble all day long. That’s why we built our Smart Contacts App which you must install NOW if you haven’t already. 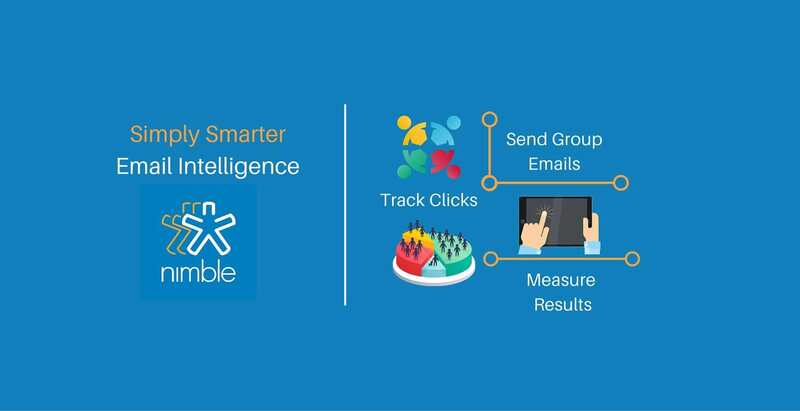 We will soon deliver email templates with open, click and reply tracking inside of your Gmail and Outlook inbox and everywhere you work via our Nimble Smart Contacts browser app. Come read our Nimble Blog and attend our Webinar to learn how our new Email Automation and Sales Enablement can help you engage smarter, better and faster, The Nimble Way. We’re extremely excited about the release of Group Messaging in Nimble and we would love to see your thoughts and feedback. For feedback, please post here. Previous Is Anyone Still Using Conventional Email?